Posted under Library, Technology on Tuesday, August 23rd, 2011 at 8:29 am, by Brian Herzog. Post and comments available via the RSS 2.0 feed. Both comments and pings are currently closed. A few I tend to use frequently and like to show patrons are SHIFT+TAB when filling out a form and you need to move back. I also like to show them CTRL+ and CTRL- to zoom the webpage in and out. Handing out or posting shortcut lists is a great idea. That said, I haven’t had a lot of success teaching the older members of my family how to use keyboard shortcuts– they just want to keep clicking on things the way they always have been. Start-R give you the Run box. Start-D and Start-M Minimize all open windows. Start-L locks the sessions and requires the password to log back in. Start Pause/Break give you the System Properties. Ctrl-Insert is another way to Copy. Ctrl-Delete is another to Cut. Shift-Insert is another way to Paste. Alt-Space brings up the window right click menu. Start-Tab in Vista and Win 7 gives you a cooler way to scroll through your open programs. Ctrl-Shift-Esc gives you the Task Manger without having to hit Ctrl-Alt-Del and click the button. Alt-PrintScreen copies only the currently active window rather than the whole screen. Anything one can do to avoid touching the mouse is a step in the right direction. People would be 100x more efficient than having to keep moving your hand back and forth. In case it is helpful, a lot (but not all) of the common Windows shortcuts work for macs as well, with the “command/apple” key replacing “control”. I probably started using a lot more keyboard shortcuts after I developed “trigger thumb” from intensive mousing related to work. Thanks for ‘WindowsKey+E’, I think I will probably use that quit a bit. Ctrl+page up takes you to the browser tab on the left, Ctrl+page down the tab on the right. Ctrl+Home to the top of the window, beginning of the doc., Ctrl+End to the end. Ctrl+left arrow/right arrow moves your cursor one word at time, Ctrl+Shift+left arrow/right arrow highlights text one word at a time, if you hold down the key it continues. @Amelia: good one – some patrons don’t even know that Tab will get them to the next form field. 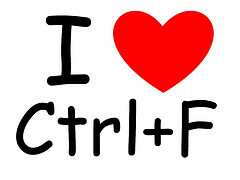 And holy smokes I can’t believe I left out Ctrl+ and Ctrl- – those are great. @Ayse: that’s always worked in my experience too, but my Mac experience is so limited I always want to test and retest things before I tell anyone about them. The list on Wikipedia include Mac commands though, so I’ll look through those more closely. @Thomas: I forgot about most of those – I definitely use Ctrl+End and arrows to move around documents – thanks. @JG: That one is right up there with Ctrl+P for me – thanks for reminding me. Oh, and Ctrl+A is a good one, too. Alt+F4 for closing a program. ESC for stopping a loading page. Sometimes shortcuts also make computer instruction easier. The “Start + Pause/Break” in Chris’s comment is a great example. For a computer class, I made instructions for getting system information, then expanded them when I realized the steps were different for different operating systems. Then I bumped into “Start + Pause/Break,” and one line “Hold Start and press Pause/Break,” replaced all my other effort. Ctrl-Shift-Del in most will get you a window to delete cookies, temporary files, etc. Ctrl+A – Select all Is a good one for the list. It is handy for copy and pasting, especially for patrons that are not great with a mouse yet. Useful for when you want to copy a large amount of text but have trouble getting it all highlighted when the page needs to scroll. But I agree that keeping the list short and basic is a good idea. So go minimal vs. comprehensive. Recently had someone ask how to refresh a page (the new appearance of explorer was throwing him off) and taught him F5. The ones I use constantly and windows-left arrow and windows-right arrow to create split screens. Have taught that one to some coworkers. This, though, only works on newer windows versions, 7 definitely. Not sure about Vista. Does not work in XP. Ctrl F is great, but the greatest is Ctrl Z in word processing. As soon as you/they realize they’ve messed up their document, Ctrl Z to the rescue. I use pretty much all of those but hadn’t heard of ctrl+tab/ctrl+shift+tab for Firefox. I’ve been opening several FF windows in order to alt+tab it for toggling ease, but now I don’t have to! Thanks! @Oleg: You are welcome – it’s a little tricky, but I’m sure you’ll get used to it quickly. Something else you can do with tabs is drag and drop them to rearrange them – I do this all the time, too. Ctrl + Mouse Scroll up/down – Zoom in/out of most browsers, graphics work, and MS Office, and even the desktop. Same function as Ctrl +up/down but I often have one hand on the keyboard and one on the mouse. I don’t think this was an option on XP. Alt + Cursor left/right moves you Back and Forward in browsers and Windows Explorer. Alt + Space + M – Minimize the current window… works great from the “home typing position” to quickly hide from the boss what you REALLY do on company time.